As the end of the school year quickly approaches, activities such as concerts, dances, and other special events dot my calendar. The excitement that buzzes in a school during this time of year is palpable, and everyone looks forward to something. Tonight I plan to serve as a chaperone at the high school prom. I have what I consider to be the best job at the prom...ticket taker. I see students as they arrive at the venue, looking fabulous and thrilled to be there. Their elegant attire gives the students an air of sophistication and everyone is on their best behavior. Students always remark how much they enjoy seeing their teachers outside of the normal school day. A few girls in my AP Spanish class asked what I planned to wear and eagerly showed pictures of their dresses to me. Yesterday my students took the AP test. I prepared goodie bags and breakfast treat for them to enjoy before the test, but hardly anyone ate. They waited nervously for the official test time before going to the room where the test was administered. But later, as the students walked down the hall during a break between sections on the test, they gave me enthusiastic thumbs up signs and were all smiles. After the test, students stopped by my classroom to pick up their backpacks and reported that the test was "easy." I'm thrilled! 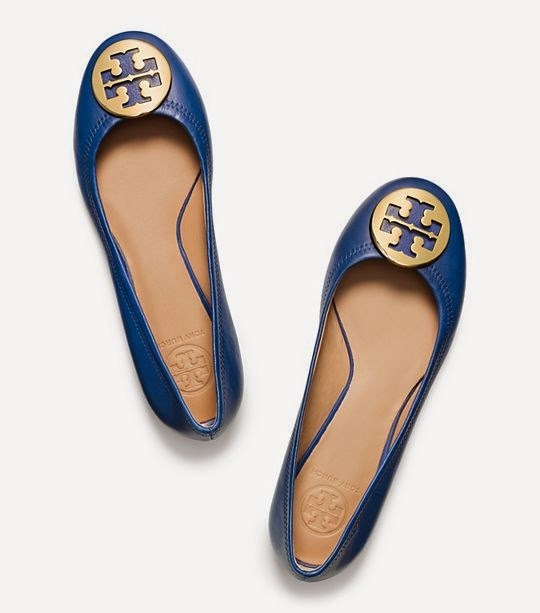 Tory Burch has some fantastic new markdowns and sale items right now! As you know, Reva Ballet Flats rarely go on sale, so these gorgeous shoes are a fabulous deal at more than 25% off the retail price. Earlier this week, I learned that Reese Witherspoon debuted her adorable clothing line, Draper James. The collection looks delightful and many pieces are selling out quickly. Warm temperatures and oodles of rain made the flowers and bushes bloom around my house. I eagerly await the full vision of the azaleas that are just starting to show their color. To be honest, I don't have much of a green thumb, so I appreciate any comments or suggestions that you have for me, especially for my hydrangeas. Last year, we only had a few blooms and hope for more this season. I fed the flowers with Miracle Gro earlier this week and hope that I see good results from it. How much sun do your hydrangeas get? I couldn't get mine to bloom and someone told me they don't like full, hot sun :( I had lovely green leaves, but no flowers. The hydrangeas get sun for about 4-5 hours in the morning. We also had green leaves, but only a few flowers. I love the look of full, lush hydrangeas. Fingers crossed for this year.